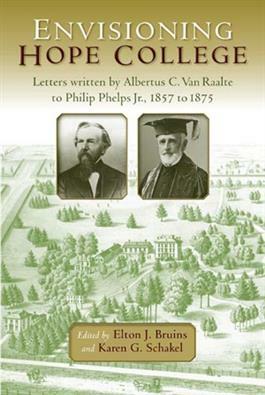 These ninety-four letters of Albertus C.Van Raalte, founder of the city of Holland, Michigan, to Philip Phelps Jr.,who became the first president of Hope College, are significant for two reasons in particular. First, of all the publications about Van Raalte—beginning in 1893 with the first of five biographies—none reveals fully who the man really was, since Van Raalte's words are rarely quoted. In these letters, Van Raalte's voice is unscripted and clear. The reader can learn much about his character and personality from what he wrote to Phelps, his co-worker and friend. The letters reveal the high points in his life and the many low periods, when he felt overwhelmed with the task of raising money for Hope College. He was often quite ill while striving to bring his and Phelps' vision of an institution of Christian higher education into existence. Second, these letters are deeply personal because they were written to his close friend and confidant. The extant letters of Van Raalte number in the hundreds, but few of his correspondents were as trusted as Phelps. Van Raalte's dominant personality, as well as his drive to develop the Holland Colony that he founded in 1847, left little room for the development of close friendships. Phelps was part of Van Raalte's inner circle, and due to their kinship and the common cause of Christian higher education, Van Raalte opened his mind and heart to an extent that he rarely did with others. These letters therefore reveal more of his personality and inner feelings than any other of his extensive body of writings. The letters also include much discussion of the development of Holland, Michigan (the outgrowth of the Holland Colony) and the establishment of theological education in Holland. The depth of the Civil War struggle became personal for Van Raalte when two of his sons enlisted in this conflict. The Dutch Reformed Church in the East also figures prominently because Van Raalte and Phelps were constantly raising funds among those churches, particularly in New York and New Jersey. Finally, we become acquainted with Van Raalte's faithful and long-suffering wife, Christina de Moen Van Raalte, who was often left raising their large family and taking care of their personal business when her husband was away for many weeks at a time raising funds for Hope College.